The television series called 'Roots' was viewed by millions; later on it was rerun and viewed by more millions. It traced the origin of one black family, or their roots back for a couple of hundred years, or so into Africa. Now the Jews know their roots. It's traced through the Bible all the way back to the very first created man, Adam, and their mother, Eve. Also, the Arabs know that they, almost every Arab knows he is descended from Ishmael. And Ishmael was a son of Abraham mentioned in the Bible; and through that, they have their roots all the way back to the first created man, Adam. Also, the Turkish people are generally known to be descended from Esau. They have their roots in Esau. And Esau is mentioned in the Bible, and you have his genealogy all the way back to the first created man, Adam. But where are our roots? Where are the roots of the American people, the Canadians, the English, and the people of North Western Europe, even of Germany? Why is our identity lost? Why is it we do not know where we are? Our identity is lost while other people can trace their ancestry and their roots all the way back. Well, I am going to give you the answer. Because our roots can be traced, and we can come to know who we are, and I am prepared to reveal that truth to you. Now the Jews are pretty well recognized for who they are because of their recognition and continued recognition of the seventh day Sabbath. It's known in so many quarters even as the Jewish Sabbath. There are people observe Sunday, the first day of the week. Now why, and how did the New Testament Lord's Day originate, and by what authority? I would like to even tell you that. All of this leads to an astounding truth that will be shocking to many of you. Now the time has come to reveal that truth. As you read in II Kings 16:6, the first place where Jews are mentioned, they were at war against Israel. Now can you imagine that? The Jews at war against Israel. Why, doesn't everybody teach that the Jews are Israel? But the truth is they are not. The Jews are not Israel at all. And it is time we get some of these identities straightened out. And then Israel rejected him as king. And they took the man who had been, well, today we would call him the prime minister under Solomon — his name was Jeroboam — and they made him the king. And they set up the capital in Samaria, the city of Samaria, north of Jerusalem, some several miles north of Jerusalem. And they rejected Rehoboam as king. At that time the tribe of Judah seceded from Israel and became the kingdom of Judah. They took a new name. They became known as the kingdom of Judah. Now the tribe of Benjamin went with them; because, they were located adjoining them in territory, anyway. And the first thing that the new king Jeroboam did was to change the seventh month festivals of Israel, which was the Feast of Tabernacles, to the eighth month. And also he changed the seventh day of the week, or the Sabbath day, from the seventh day to the eighth day — which was Sunday, or the first day of the week, the beginning of another week. And so a great division was made. Now the next thing that King Jeroboam did was to put away all of the Levites, who were the priestly tribe. They were the better educated people. They were the most highly educated, the most influential people in Israel. But he put them away because he was afraid they would lead the people back to King Rehoboam, and Jeroboam would lose out on his throne. And so the tribe of Levi joined with Judah also, and the three tribes of Judah, Benjamin, and Levi became known as the Kingdom of Judah. They were not Israel. They were now the Kingdom of Judah. Now for the time of nineteen different kings and seven dynasties, the kings of Israel continued to rebel against their God, the Creator. And finally, God had warned them that He would drive them out. And finally, He did. And now we trace the history of what happened in II Kings the seventeenth chapter beginning with verse five. II Kings the seventeenth chapter beginning with verse five. "Then the king of Assyria came up throughout all the land, and went [up] to Samaria [Israel's capital and Israel's land. The whole land was called Samaria by that time] and besieged it three years" (II Kings 17:5). Now, that was from 721-718 BC. And it said he besieged it three years. That's in 721 to 718 BC. So the nation Israel finally lost its identity. It was driven out away from God. They lost their identity and became known as the 'Lost Ten Tribes.' They lost the Hebrew language. They had turned from the seventh to the eighth month. They had turned from the seventh day of the week to the eighth day. And God meantime had made an everlasting covenant with Israel. It is recorded back in Exodus 31. He had made a covenant with them that was for all eternity, an everlasting covenant with all Israel. This was long before the division between Israel and Judah. This goes clear back into the days of Moses. Now I want to read you that covenant. And it is in Exodus 31 beginning, well, I will begin here with verse 13 where God said to Moses, "Speak thou also unto the children of Israel, saying, Verily my sabbaths ye shall keep: for it [that is the Sabbath] is a sign between me and you [in other words between God and Israel, or between God and His people] between me and you throughout your generations; that ye may know that I am the LORD that doth sanctify you" (Exodus 31:13). Or that I am the LORD that sets you apart from other nations. Sanctify means set apart. So it was a covenant. It was perpetual, never to end. Now incidentally, let me mention, this is a covenant, and it is no part of the Old Covenant. It was made after the Old Covenant had been, well, as we might say signed, sealed, and ratified: ratified by blood, as you read back in the twenty-third and twenty-fourth chapters of Exodus. And this is in Exodus 31. Now a sign is an identifying mark. A retail merchant hangs a sign out in front of his store. Oh, it might say 'Jones and Company, Furniture'. It tells and identifies who owns it. Jones owns it, Jones and company. And what is it? It's a furniture store. Or it might say Drugs, or whatever. So it was made an everlasting covenant, it was no part of the Old Covenant which was abolished at the cross. It was a separate covenant that was eternal, and as a matter of fact continues on today, if you know who Israel is. Now, the main nation, Israel, had lost its identity. And the Jewish people from the tribe of Judah, Benjamin, and Levi only remained. They were all that remained in the land of Palestine. Later they were taken away to Babylon. And even after that, then, a certain colony was sent back to Jerusalem seventy years later to rebuild the temple which had been destroyed by King Nebuchadnezzar of Babylon along about 585 BC. But the nation of Judah retained their identity; because, they retained the seventh day Sabbath, which had been the sign that identified them. It identified God because in six days God created the heavens and the earth and rested. It identified Him because creation is the proof of God: and creation identifies God and who God is. And so it identified God to them. It identified them not only to God but to the world. Now the Jews kept the Sabbath sign. And they today suppose that they are Israel because they keep the Sabbath! And yet they are only Judah and not Israel. And Israel was driven out and became lost. Now, they lost the Sabbath. They did not keep it; they had turned to the eighth day which became, of course, the first day of the next week or Sunday. Now after 718 BC. lost Israel and Assyria moved west and northwest. They moved from the southern shores of the Caspian Sea. And by the time Judah was taken to Babylon, they had already moved more than 100 years before: when Israel was taken captive. Now, they had moved west and northwest. Now the Assyrians had settled in the land that we call Germany today. And the Germans of today have their roots back in ancient Assyria. They don't know that and they don't know who they are. The ten tribes moved on into Western Europe and into the British Isles. And it is pretty well identified today that especially the northern French, the French people are the descendants of the tribe of Reuben, that the British were the descendants of Joseph. And Joseph was really divided into two tribes: Ephraim and Manasseh. Now the British were quite a colonizing nation. They colonized all over the world. And that is a matter of history. It gets down to our time. It's just recently that Britain has lost so many of her colonies, but she did possess India, she possessed most of Africa, she possessed countries all over the world. And she finally grew rich in that way. She was a colonizing people and the Bible says she was to lose her first colony. And the first colony had come to the United States. Now, I have my ancestry back, and my ancestors migrated from England to the United States about 1660, or something like that, or 1670, with William Penn and settled in Pennsylvania: named after William Penn. They were Quakers by the way. And well, Pennsylvania is called the 'Quaker State.' That's its nickname. But how can we learn and recognize our national roots? The first colony of England migrated to the United States, and are identified, if you will study it closely and with many, many text and passages and different places in the Bible, as the descendants of the tribe of Manasseh: one of the twelve tribes of ancient Israel. And part of the 'Ten Lost Tribes' that lost their identity, and don't even know that they are Israel. And think they are Gentiles, and the world thinks so. And the world doesn't know what are their roots or where they came from; because, they became lost. They lost their language. Now we find today, they are speaking the English language. Or they find it didn't exist back seven hundred years before Christ. And the Assyrians had settled in Germany. All of that is a remarkable thing in giving us the roots, or the history of our own people: where we came from, who we are, and we can trace our identity all the way just like other nations can back to the first created human being, Adam, and his wife God made from him, for him called Eve. And all humanity has come from them. And we can have our identity back that far. Now, I have written a book which through many years now has gone out to: well, I was going to say millions of people. I don't just recall how many million. I don't think we have kept a record of the exact number. 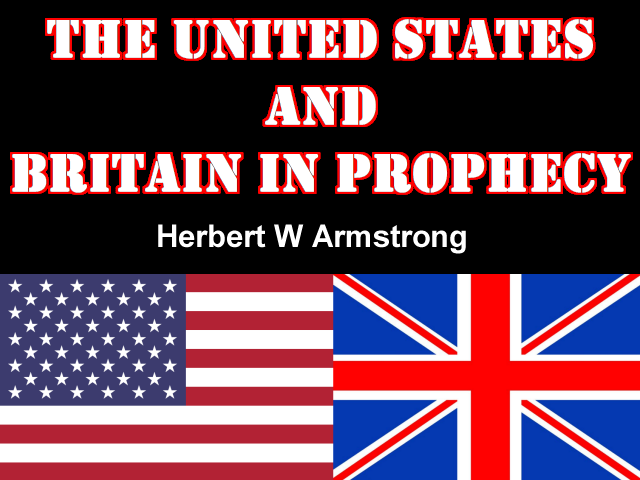 But this booklet, 'The United States And Britain In Prophecy,' millions of people have read it. It's the most circulated booklet we have ever put out. And I want to announce it once again, and that will give you some startling information about our ancestry: about your own roots, where you came from. And not only that, it is the key to understanding biblical prophecy. And it shows you what Bible prophecy says is going to happen to the United States in the next few years. Now you wonder, where are we going from here? The world is in trouble and United States is approaching trouble, many troubles. And it is all written in the Bible. And you cannot understand it without this knowledge of our identity — of our own roots: who we are, where we came from, and where we're going. The booklet is 'The United States And Britain In Prophecy.' Now there is no charge. All you have to do is request it. It's an illustrated book. It's a good many pages, and it will not only identify you and give you the key to understanding all prophecies, but it specifically pinpoints the United States and where we are mentioned as nations, the British and the American people in biblical prophecy. And, what is going to happen in the next few years. What already has happened in Britain is recorded there, incidentally. Now at the same time, I want to send you another booklet along with it, 'Where Is the True Church?' today. I have said something about that in recent programs. The true Church of God has had great difficulty. It has been the 'persecuted' church. And great false churches have risen up, but Jesus Christ said that "...the gates of the grave will never prevail against [it]" Matthew 16:18) — His Church. And it does still exist today. Where is it? This booklet will tell you that. Now also, the finest magazine in the world is published by our organization, called 'The Plain Truth.' Seven million circulation, seven million copies per month going out which makes it one of the largest magazines in the world. It is a very large mass circulation magazine, all over the world. And, it has a lot to do about the Olympics in this number because they are coming to Los Angeles. And here is an article, 'Tomorrow's News Today' and that refers to biblical prophecy. Prophecy is telling or forecasting what is going to happen before it happens. You get the news of the future today. You know when you get news on television or in the newspaper, as one comic said, "It should be called olds because it has already happened. It is already old. It's even less than 24 hours: it's old. And should be called olds." he said. Well, news is what is 'new' and it is going to happen. It just assures that it has already happened, but it hasn't already happened, yet. Now here is another article, 'D-Day the Untold Story.' It's come out at last, and it's about D-Day and how it led to the winning of WWII and how God Almighty managed the result of that war. And what happened and it wasn't just by the 'might' or the armies of the allies, but God Himself determined the outcome of that war. There is some news here that is going to surprise you. Now, 'The Plain Truth' is the most important magazine. It is the finest magazine, the best illustrated magazine in the world, and there is no subscription price. Now this, it is in its 50th year already. It's not a new magazine. It has been out for a long, long time. And it is the only magazine in the world so far as I know that has never increased or raised its subscription price. Its subscription price is zero. You don't have enough money to buy it. But you can subscribe by just sending in, or calling in by telephone — I'll give you the number immediately — and you will have a year's subscription absolutely free. But you have to request it for yourself.